Carcassonne , Klaus-Jürgen Wrede, Hans im Glück/ Rio Grande Games, 2000. Game review by Dan Becker, 2001/03/10. Worn, dented, scratched. That's how I would describe my Carcassonne box. Wrinkled, folded, spindled. That's my Carcassonne rules sheet. Scuffed, rounded, frayed. That's my Carcassonne tiles. It's all well worth it though, for Carcassonne is my most played game since purchasing it 5 months ago. In fact, the same is true for my games group, as Carcassonne was the most-played board game in 2000 (see my article on Games Played in 2000) and is on its way to be the most-played game of 2001 as well. In this review, first I will go over the rules briefly, then I will discuss some positive and negative aspects about the game, and finally I will discuss some game strategies. Assuming you are somewhat familiar with the game, I will go over the rules briefly. Carcassonne is a tile-laying game for 2 to 5 players. The theme surrounds the French mediaeval walled city of Carcassonne, but in game play it is similar to pipe laying or track laying games. On a turn, each player selects a tile randomly and places it abutted to the previously played tiles. After placing a tile, the player may place an optional follower on the tile in one of the tile regions: field, road, city, or cloister. As each player has only 7 followers, or "meeples" or "dudes" as they have affectionately been named, the scoring opportunities are extremely limited. Once a region is complete, it will score points for the player with most numerous followers in the region. The player with the most points wins the game. The points scoring system is the heart of the game and the play balance. A road scores 1 point per tile. A cloister scores 1 point per tile for itself and all adjoining tiles for a maximum of 9 points. An incomplete town scores 1 point per tile or shield symbol, but completing it doubles this value. Farms do not score points per-say. However, completed towns score 4 points for the player with the most adjoining farmers. This has been a point of confusion among many beginning players, so it is best to look at each completed town and count adjoining farmers to figure these scores. Aside from farms which are not scored until the end of the game, completing a region returns your follower to your stock pile for further play and scoring. My opinion of the game is that it is a bargain and has very high replay value. It plays well with either 2 players or up to its stated maximum of 5 players. It is short enough that it can be played 2 or 3 times in the course of an evening. There are multiple paths to victories, and games can be won through farms, cities, or cloisters. There are both offensive and defensive plays. It is liked by both beginners and experienced players. As you can see, I highly recommend it and mince no words about liking it. Update 2002/05/25: This table shows the Carcassonne Expansion tiles. Update 2002/05/25: See the easy-to-print chart. What are its flaws? Some say the element of chance is too high. Some say a draw of a single tile is too luck dependent, and that a player who draws well will win. I say the counter-argument to this is that one must not develop regions so linearly in the game. For instance, do not just concentrate on one farm or town. Rather, use every follower you have on the board as an avenue for development. If you have 5 followers on the board, developing 5 scoring situations, you are more likely to draw a tile you need. Another simple remedy would be to use a variant of having a 2 or 3 tile hand. Players begin their turn by drawing to a hand of 3, then any tile may be played to the board. This simple rule change is an enjoyable and easy fix to a perceived problem. Other detractors say the cloisters or the farms are too highly valued. However, the counter argument to this complaint is that every potential scoring play has its counter-move. For instance, let's say someone with a lot of farmers is completing many small cities for a score of 4 points each. In this case a player should play tiles such that cities cannot be completed so easily. An alternative strategy would be to place more farmers to directly challenge the farmer majority. A third strategy would be to use roads to dissect and limit the developing farm. In many plays of the game, I have seen almost an equal number of wins to the master of cloisters, farms, and cities. No simple pursuit of one of these regions is a guaranteed win. A player must usually balance these scorings or somehow shut the other scoring avenues down. Which brings us to the third part of this review, basic game strategy. The first basic rule is to be aware of the remaining tiles. The table at right, suitable for printing and placing in your wallet, shows how many of each tile are available. (Note: The table has been updated to show the Carcassonne and Expansion tiles. The new tiles are shown with a gray background.) There is no sense in hoping for a 4 sided city tile when the only one of its kind has already been played. Another often wished for tile is the three sided city, with or without a road. This is a somewhat scarce tile, yet players often waste many turns waiting and hoping for its arrival. Don't wait for it. Move on to other scoring opportunities. Another important rule is don't become follower-constrained. If your seven "meeples" are out on the board, and you are making moves without placing more followers, it is time to think about bringing your "dudes" home. Often the highest scores are achieved by having a good follower turn over: placing them out for future scores and completing regions to bring them home. If too many followers are invested in farms, or you have too many battling for mega-cities, you run the risk of having too many eggs in one basket. A series of small continuous scores can be preferable to that all-or-nothing giant farm battle at the end. Another area of winning strategy is to know how to be a good weasel! For each of the major regions, know how to place tiles and "meeples" to horn in on other peoples winnings. Our group does this so much, we have many names for this tactic: "weaseling", "prying in", "shoe-horning" and plain old "stealing." Here are a few examples. The figure at left shows how to horn in on someone's road. Assume that yellow has been building a very large road. In fact, assume yellow's road extends to the right for many more tiles. Assuming you, the red player, draw a road tile. You want to join in on yellow's big road. However, the rules state that only one follower can be placed on a given road, although it is allowable to have multiple followers if things join. The answer is to position the road tile to increase the likelihood that your roads will join. Here, red has placed the tile and the follower such that many tiles may possibly join red and yellow's roads. Of course there are some junction tiles that will keep the roads apart, but red has played in order to increase the chances of joining in yellow's hard work. For the second example, use the second board figure at left. Assume yellow has been working hard on a large city with many shields. Assuming you as the red player draw a city/city/farm/farm tile. As in the first example, you cannot simply walk into the city and join yellow in the wonderous bounty of 8 points. No, you must play the tile to increase your likelihood of joining. Here red plays to hopefully one-day join his fellow city-dweller. Although several tiles will still keep the cities apart, there are many that will join red's lousy slum to yellow's robust city center. Joining in this example will net yellow a mere 1 point, but will give red a bounty of 8 or possibly even more if the city completes and the city score doubles. Finally we look at the life of a helpful farmer. In the third example to the left, we see that the yellow farmer has been hard at work supplying grain to 3 (possibly more) completed cities. This will net yellow 12 points at the end of the game. However, red has drawn a city tile that continues a very tasty city. Rather than playing in the city, red decides to place the follower in the farm in the hope of "weaseling in", err I mean, joining his colleague and sharing in the bounty of 12 points. Arguably red's city tile might be worth more as a city, but joining the farms is a likely 12 points and going for the city is a definite 4, possibly 12 or more points. In this case I prefer the 12 points now, rather than a future 12 which requires more tile play. So with all the examples, I hope you see why this is an enjoyable game. There are many choices to ponder and each tile yields 5 or 10 possible plays on the edges of the town. The addition or placement of a follower adds more decisions and fun. Very quickly the game gets up to speed, the areas form, and it all becomes a big strategic puzzle to solve. There are thrusts and parries, and then it all ends in less than 45 minutes. If you think luck has abandoned you, it is quick enough that you can play it again, but beware, some players are still complaining about their luck after 10 games. All in all, this is an excellent game that is well designed. Highly recommended. Update 2002/05/25: See the Lost Tiles of Carcassonne article. 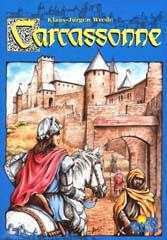 Update 2002/05/25: See the Carcassonne Expansion Review. Update 2002/05/25: See the easy-to-print Carcassonne Expansion tile distribution. Update 2002/11/26: See the Carcassonne: Hunter and Gatherers tile discussion. Last modified: Thursday, 09-Jun-2011 12:36:39 MST.